A bill that would slash the number of days allowed for early voting is likely to be pulled after scathing testimony Monday from opponents who said the bill was discriminatory and retrogressive. House Bill 2093, by state Rep. Patricia Harless, R-Spring, would limit the early-voting period in Texas to seven days before general and primary elections. Current law mandates 12 days. Harless initially said the measure was necessary to help elections administrators hire workers and volunteers, saying that a 12-day early-voting period as a possible deterrent. But after testimony at Monday’s House Elections Committee hearing, where critics slammed its intent as little more than an effort to make casting a ballot harder for everyone, Harless said she would not ask the committee for a vote. Nina Perales, the vice president of litigation for the Mexican American Legal Defense and Educational Fund, or MALDEF, said the bill would move Texas backward by limiting the number of voting days available and by creating longer lines on days when voting is permitted. She added that increased wait times would drive potential voters away. “The bill lacks a rational basis in election administration and will reduce voter confidence in Texas,” she testified. Michael Li, who live-tweeted the hearing, detailed some of the specific objections. Several county election administrators testified that the bill, in fact, might increase costs if they were to try to have more early voting locations in response to a reduction in the number of days of early voting. They explained, that’s because they would need buy additional equipment and hire more staff for the additional locations. If funds for additional equipment were not available, one administrator said it likely would mean moving early voting to larger sites since in many counties nearly half the early vote comes in the week that the bill would lop off. A number of other witnesses testified about a negative impact on voting in Texas and pointed out that the issue cut across party lines – noting that Mitt Romney received 65% of his total vote and Ted Cruz 66% of his in early voting (a higher percentage than Democratic candidates received). See Li’s preview for everything you’d have wanted to know about HB 2093 going into the hearing. That last comment above highlights the most puzzling aspect of this bill. In Harris County, at least, early voting is generally dominated by Republicans. I don’t know about you, but I remember a non-trivial amount of freaking out among Democrats during the first week of early voting last year, when it was clear that the Rs had taken a substantial lead. Dems largely caught up over the last few days of early voting, and then won Election Day, but the pattern in 2012 has been the norm in Harris County, not the exception. 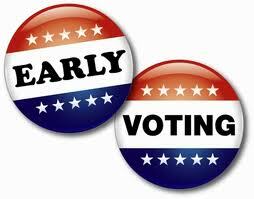 EV = Early Vote, ED = Election Day; STR = Straight Ticket Republican, STD = Straight Ticket Democrat. Numbers don’t add to 100% because of third-party straight ticket voting. Obviously, 2008 is the outlier. I think memories of that year are what motivated this bill, and also what caused that aforementioned freakout. But in every other year where early voting has existed, Republicans have taken a majority of the early straight ticket vote, while Democrats have won Election Day in three of the five. In all cases except 2008, Republicans did better in early voting than on Election Day. Frankly, I don’t understand why the Harris County GOP didn’t oppose this bill. This time, 2008 is an inflection point. We like early voting. I see no reason to believe that will change. Reducing the number of days to vote early can only make the experience worse. Which, it must be said, was likely part of the calculus, Rep. Harless’ stated surprise notwithstanding. After the hearing Harless said the opposition came as a complete shock. Had the opponents “bothered to pick up a phone” and call her office, she would have not wasted the committee’s time, she said. Oh, please. I don’t know how old Rep. Harless is, but I’m pretty sure she wasn’t born yesterday. This bill serves no obvious purpose. What did she think the reaction was going to be? Texas Politics has more, and Michael Li recaps the other bills that were heard in the Elections Committee yesterday.